It’s early morning and the clouds are swirling over the dunes in thin, misty drifts. The mountains are every shade of purple: the deeper hues intensified by the paleness of a sheer blue sky. I’ve hiked past the lagoon, climbed the highest dune and am sitting on its summit, tracing its wind-crafted contours as it rolls down to the sea and the sea rolls in, over a flat, empty shore. Not many people are up – but I’m glad I’m among them – to watch the sun break through the clouds and the lagoon shine gold. Egrets and moorhens paddle at the water’s edge; a flamingo struts through the shallows. 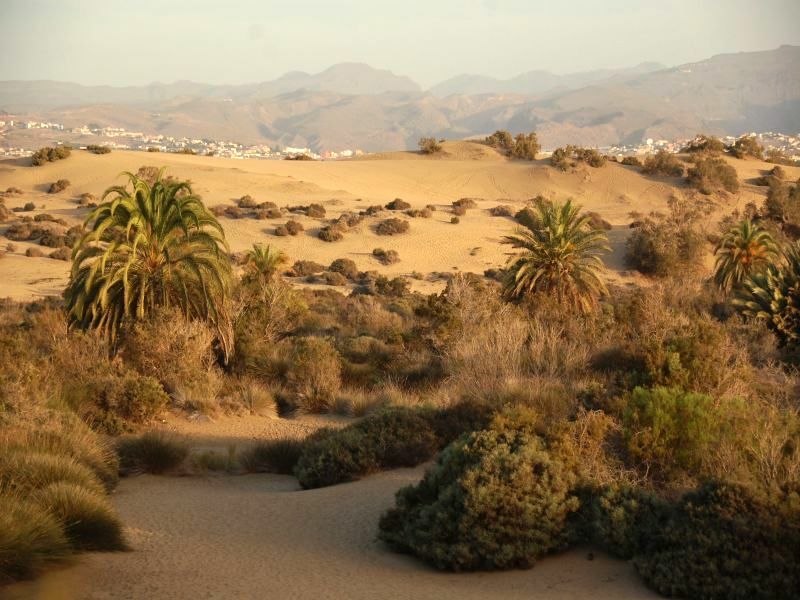 The sandy mountains of Maspalomas in Grand Canaria cover 400 hectares, and while inland they’ve been declared a nature reserve, close to the Atlantic they’re home to some of the island’s most luxurious hotels. In the distance, is mine, looking at present, as if it’s rising out of the sand: a solitary, futuristic-looking cube, painted a pristine white with colourful iconography and glistening glass. The Seaside Hotel Palm Beach is just a few minutes walk from the dunes, through a quiet road of low, whitewashed houses with wrought iron fences and gardens of bright bourgainvillea. 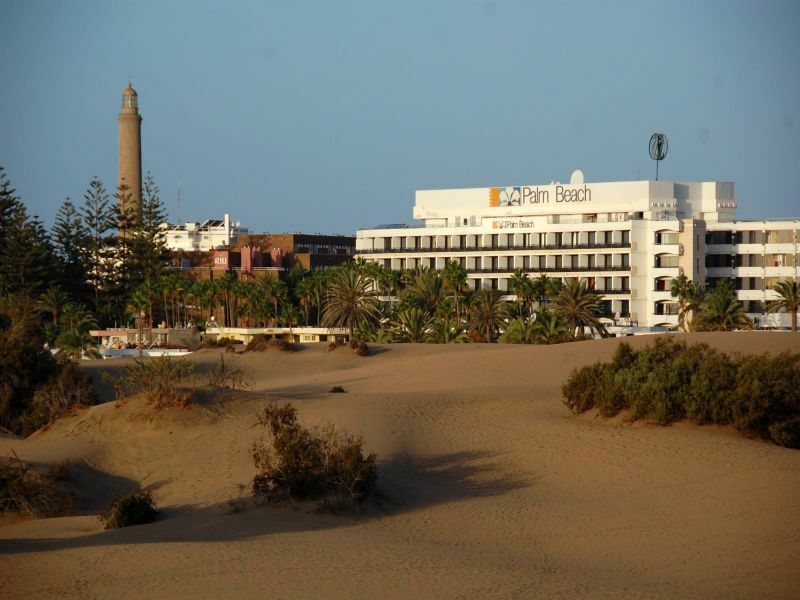 It’s the only hotel in Grand Canaria to be a member of the Leading Hotels of the World group. The lobby sets the tone, with its crazily-patterned carpets, rainbow coloured sofas and coffee tables with sunken bowls brimming with fat, yellow lemons. The style is retro-chic: bright, bold and very seventies. The bar is a clash of purple and cerise; the main restaurant has splashes of orange. Its tables, draped in yellow linen, sit beneath displays of black, heavily-glazed pots, their shininess accentuated by faux crystal chandeliers. The hotel is set in an ancient palm grove where yoga and tai chi are taught beneath the trees. Paths curve through tropical gardens past a small aviary, fat round cacti and native aloe vera plants whose succulent leaves are considered the purest in the world. Tucked away in the grounds is the spa, a small, open air fitness centre, thalassotherapy pool and stone outbuildings with various saunas. I tried the signature treatment, Pantai Lua, a deep tissue body massage using hot pantai oil and cotton pouches filled with Indian herbs, then relaxed in a Finnish sauna. Later, I strolled outside, cocktail in hand, for a seafood buffet on the terrace: barbecued salmon with traditional “papas arrugadas” (salt-caked potatoes), a fruity Canarian white wine and gorgeously gooey profiteroles (the hotel has its own bakery). It was tempting to spend my mini-break sprawled on sun lounger beneath an unremittingly blue sky. 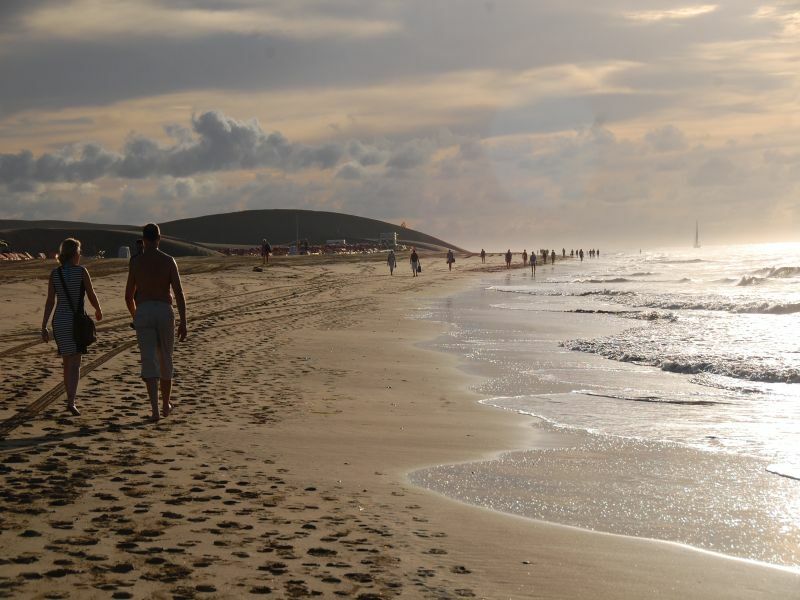 But the island’s tourist hotspot and Spain’s seventh largest city, Las Palmas, beckoned. Las Palmas is a busy, working port, thronging with container ships and cruise liners, yet it still has that easy going feel of the Mediterranean. Encompassing two, sandy bays, Playa de las Canteras and Playa de las Alcaravaneras, there bars with sea views, small shops selling pottery and hand-painted tiles and old men strumming guitars, winning the odd smile from holiday makers as they stroll along the promenade. I had a coffee overlooking the 3 km stretch of Las Canteras Beach then wandered through Parque Doramas, admiring its fifty year old dragos (dragon trees), planted by the British in the 19th century. With their heavy, solid branches sprouting in various directions, they resembled confused signposts. 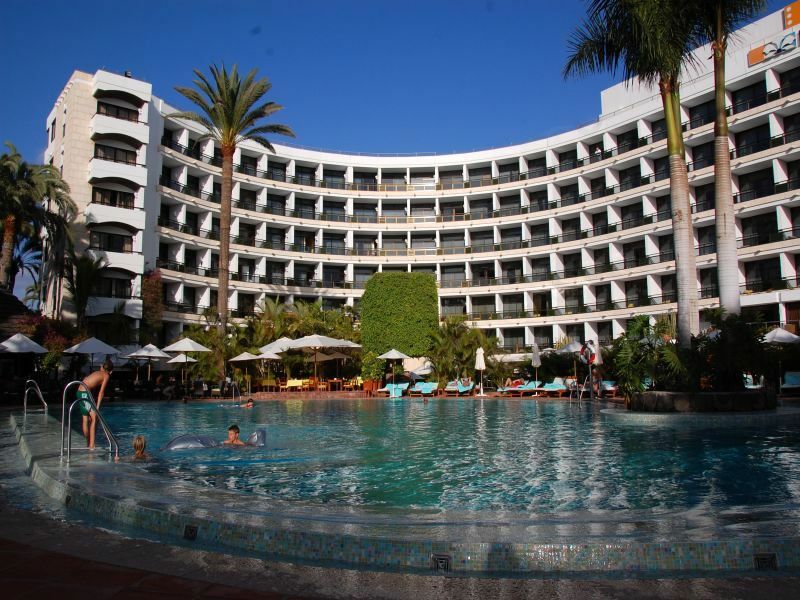 Behind the park is hotel Santa Catalina, once popular with Agatha Christie and Churchill. It has a grand, arcaded entrance, traditional wooden balconies and showy turrets. Across the road is Plaza del Pueblo Canario, home to the Nestor Museum, dedicated to the Spanish modernist painter. The square was built by his brother, Miguel in the 1950s. The city’s historic quarter, Vegueta, is a UNESCO world heritage site. Narrow cobbled streets open onto large squares with imposing 15th century buildings. Behind the cathedral is the yellow Casa de Colon where Christopher Columbus stayed in 1492 during his first trip to America. 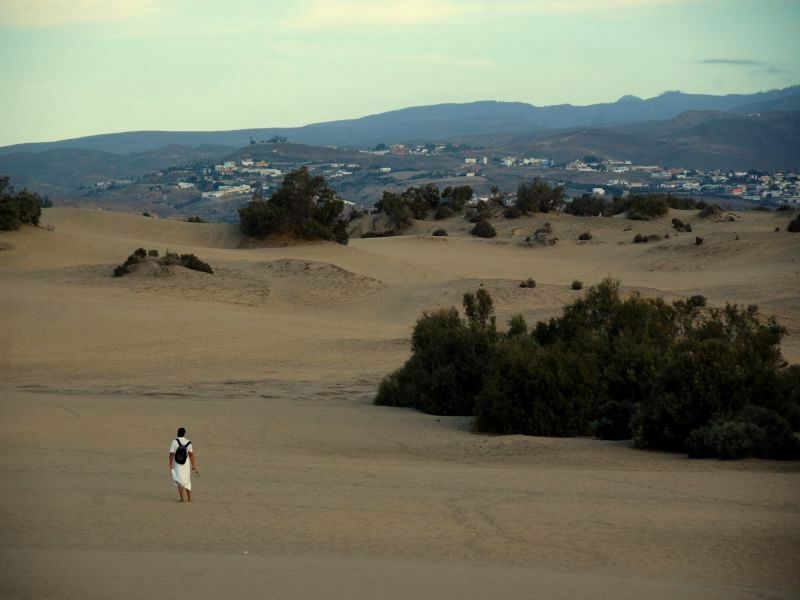 It’s now a museum charting the history of the Canary islands. 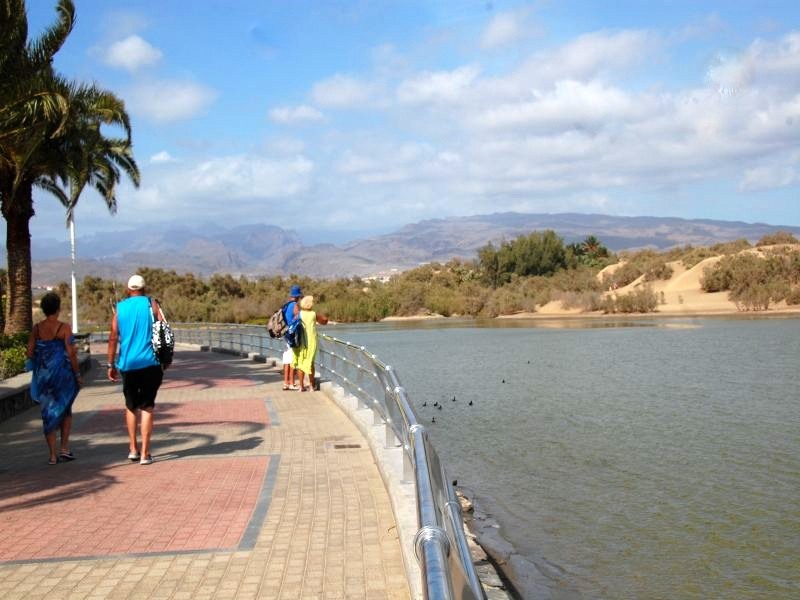 After a day’s sight-seeing, I was ready to retreat to Las Maspalomas for a final stroll along the shore. As the Atlantic rolled in and the sun dropped out of the sky, it was the dunes that again stole the show. I watched as they turned russet and crimson – their mountainous, sweeping curves blessing Gran Canaria with a sense of the exotic, just minutes from Palm Beach’s door.